Would you enjoy playing a game of PacMan with carrots or tinkering with a set of play dough piano keys? 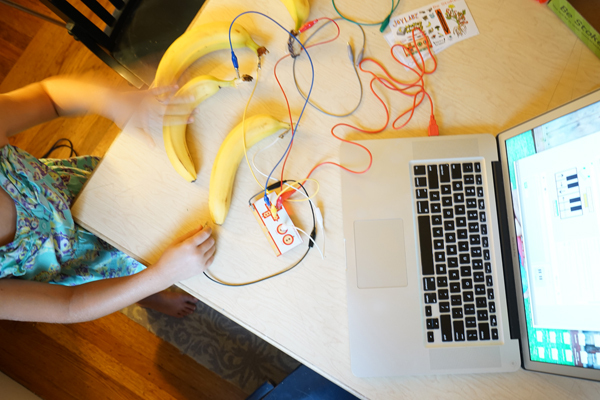 If the answer is “yes,” then Makey Makey might be just the toy for you! 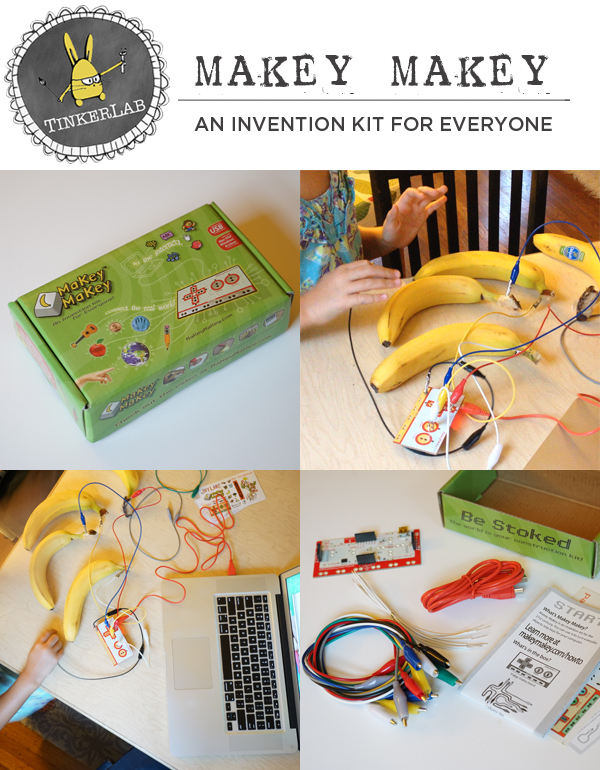 Today I’ll show you how to make a Makey Makey Piano with bananas! I’ve been following Makey Makey by JoyLabz for a while and we finally got the chance to play with our very own set. That’s a great question — before we brought ours home I wasn’t entirely sure either! 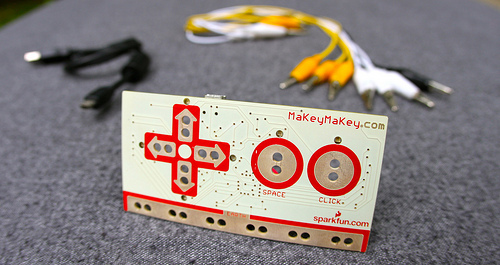 Makey Makey is an easy-to-use invention kit that’s essentially a printed circuit board that connects to a computer via a USB cable. Wires connect Makey Makey to conductive objects (i.e. 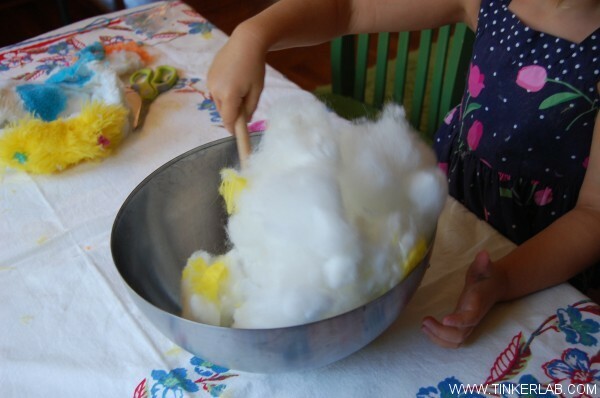 play dough, bananas, aluminum foil, coins), which can then be played much like a joystick or keyboard key. Basically, Makey Makey takes over the functionality of the space bar and other computer keys, and the conductive objects become the computer’s new keys! Cool, right? One more thing: Do you see my daughter holding one end of the black wire in the photo (above)? YOU close the circuit to the ground with your body by holding one end of an alligator clip while playing with Makey Makey with another hand. If you let go of that wire, nothing works. This makes for a strong lesson in how circuits work. Awesome for kids! How does Makey Makey work? It’s an Arduino Circuit Board. The heart of Makey Makey is its circuit board. The Makey Makey board connects to your computer via the USB cable (see the orange cord). Ground the Circuit. Connect one end of a wire to the board with the simple alligator clip technology. Hold the other end of the wire with your hand, and YOUR BODY now completes the circuit. Replace keyboard keys with conductive materials. Attach one end of an alligator clip to a spot on the Makey Makey board, and the other end to something conductive. We chose bananas. This is where Makey Makey gets interesting. Once you get the hang of how Makey Makey works, you’ll certainly come up with new ways to tinker and create with it. 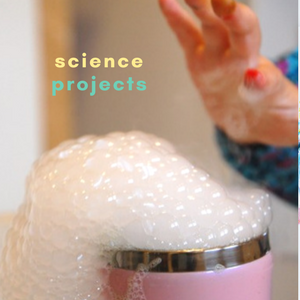 The Makey Makey website has a pages of creations and games that people have invented around their product: talking water fountains, a heartbeat wall. And my favorite: the Giggling Circuit. You’ll want to try that one! Here’s a link. And my all-time favorite: Eat the Star Spangled Banner. Oh-my-goodness. Amazing fun. 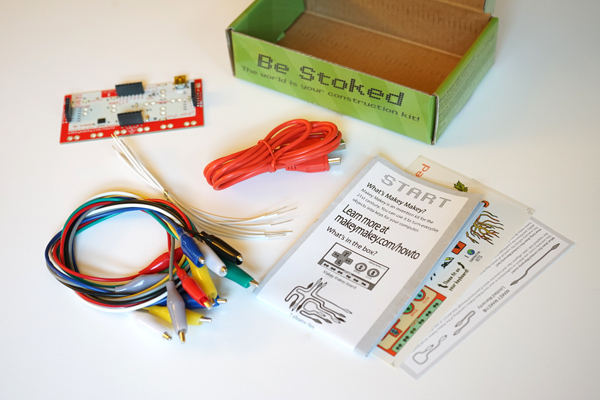 The Makey Makey website includes step-by-step tutorials that offer ideas for collaborations in school and other group settings. The Tech Museum in San Jose invented a game for their Maker Space that invited teams of kids to work together to build human-size circuits with a chain of bodies. They look like they’re having so much fun! I couldn’t find an official age range on the product’s site. My kids are 4 and 6, and they loved playing with Makey Makey once I set it up. They quickly understood how to build a circuit with their bodies, and also enjoyed the task of testing various objects for conductivity. 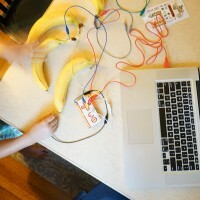 Depending on a child’s experience with electronics and computers, I would guess that young teens would be able to use Makey Makey on their own. Younger children will need adult assistance, but it’s just as interesting for adults as it is for kids, and makes a cool side-by-side learning experience. Directly from Makey Makey. If you’re a school, you can order with a P.O. from Makey Makey. We had so much fun with Makey Makey, and look forward to testing it out in more ways. Thanks to JoyLabz for sending us the Makey Makey kit to review. All opinions shared here are our own. 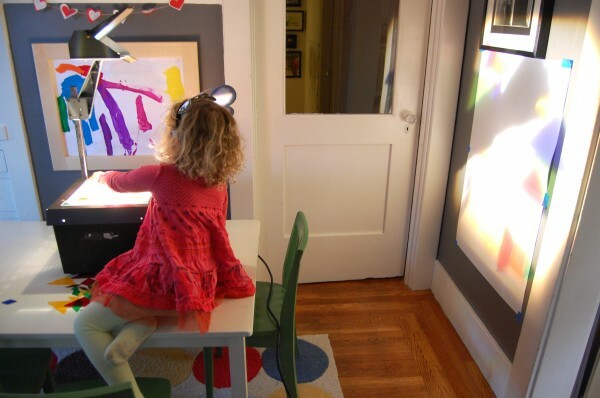 Young children are full of their own ideas, confidence, and enthusiasm for the new. As much as we hope they’ll retain this strong sense of self, as they get older it’s possible that their confidence can diminish with the influence of peers or self-doubt that comes from not being able to bounce back from failure. I hope that my kids can retain a strong sense of self as they grow older. Given that my kiddos are girls I’m acutely aware of how easily they can lose themselves in the face of strong personalities. The rise of books such as Raising Confident Girls: 100 Tips For Parents And Teachers , The A to Z Guide to Raising Happy, Confident Kids , and how girls THRIVE demonstrate just how critical this issue is for children, and perhaps girls morso than boys. 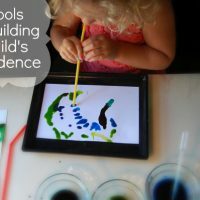 I wrote a post about Six Tools for Building a Child’s Confidence and share three more with you today not as doctrine but as inspiration. I’d love to hear your thoughts on this — what tools do you think are important for building a child’s confidence? Children put an enormous amount of stock into what their parents or teachers think, and it’s our role to show them that we believe in them. My 4-year old loves, loves, loves my sewing machine. I don’t let her use it unsupervised, but when she does use the machine all I do is help her guide the fabric. She presses the pedal, lifts the foot, and cuts the thread. The same can be said for the hot glue gun, electric mixer and cooking at the stove. We don’t do these things all the time, but I try to find ways to build these moments of trust into our days together. 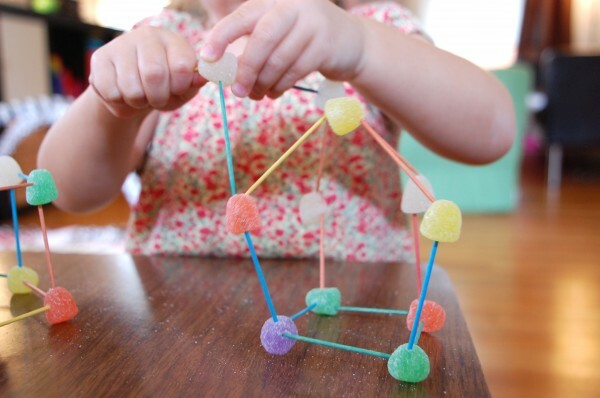 For a child to truly understand how things work, he or she needs to test it out multiple times and in various ways. Think of the child who just learned to write his name and how he’ll write it in various sizes, on different kinds of paper, vertically and horizontally, all in an effort to understand the written word and his particular place in the world. 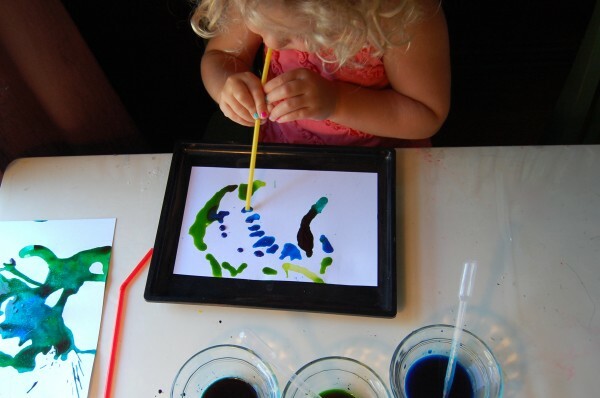 In this image taken of my daughter last year, she was painting with watercolors. 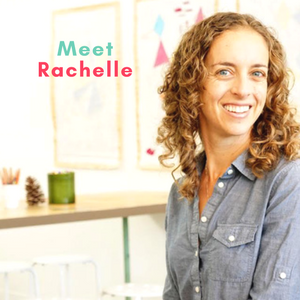 She paints with watercolors frequently and had experimented with brush painting, dipping paper in the paint, and squeezing paint with droppers. On this day, she wanted to see test the results of blowing paint with two different straws. One worked far better than the other, and she only figured this out because we dedicated time to iteration. Pulling things apart to undertand how they work helps children grasp the bigger picture of the world around them. 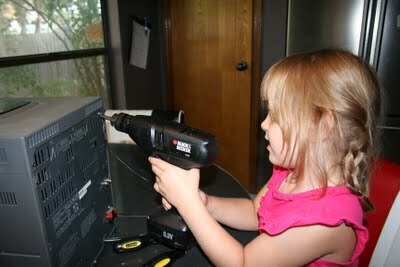 We had an old monitor that was scheduled for a trip to the dump, and decided to pull it apart (carefully) so that my daughter could get a close look at some circuit boards and wires that live behind the computer. Another, safer, way to go about this is to give children some small tools and an old clock, and a fair amount of time to take it all apart. 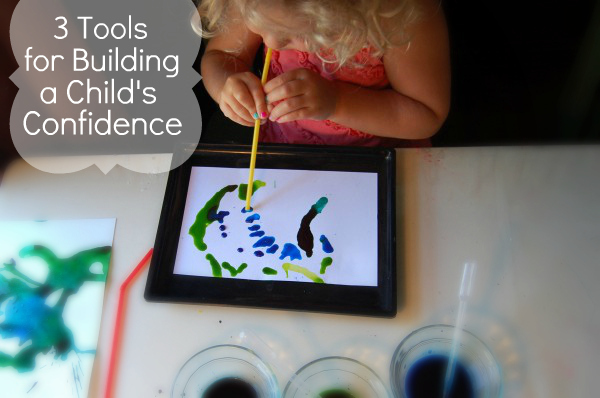 What tools do you think are important for building a child’s sense of confidence? Tinkerer: one who experiments with materials and ideas to fully understand their capacities, and who further iterates on their learning to find better solutions to current problems. 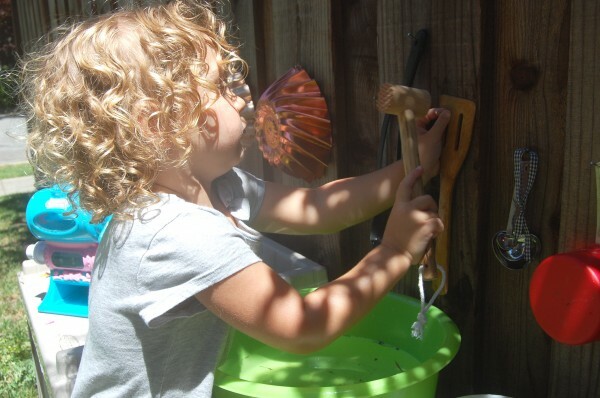 Tinker Tots is a series of projects where I share tinkering materials or tools that can be safely introduced as open invitations for children to explore and tinker. 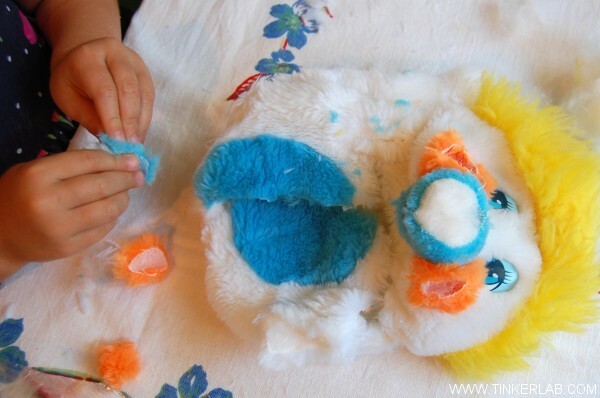 Toy or Stuffed Animal that could be easily taken apart. Choose a toy that’s not well-loved, or do what we did and pick one out at the thrift store. Our criteria: A clean toy that my daughter was interested in deconstructing. 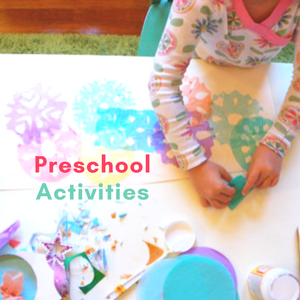 To learn how a toy is assembled through hands-on exploration, and have fun along the way. You might want to brace yourself for this one as it may seem a bit graphic. although my 4-year old didn’t seem to be unsettled by this at all. I’ll share some photos to inspire you, along with my daughter’s thoughts on the process. N, who I call “Nutmeg” for the sake of this blog, was able to cut parts of the toy open, and I helped make sure she used the scissors safely and also helped cut the more difficult parts. She wanted to start by cutting off the doll’s arms. Me: Do you like taking things apart? Nutmeg: Yeah, I do. This one is especially fun because it’s hard to cut open. When you open it you see everything inside. This was followed by cutting off the nose and cheeks, which she could tell were filled with fluff. She wanted to pull every last bit out, which we stored in a large bowl. Nutmeg (to me): Now cut the nose off. Me: What do you think is in there? Nutmeg: More cotton. That looks ridiculous! We turned it inside out to find some clues as to how it was made. Me: How do you think this was made? Nutmeg: I don’t know. I wonder how they put the hair on. That’s a big mystery. But the biggest mystery is how they put the whole thing together. That’s what we’re trying to find out. Me: What did you think would be inside? Nutmeg: I thought cotton would be inside. 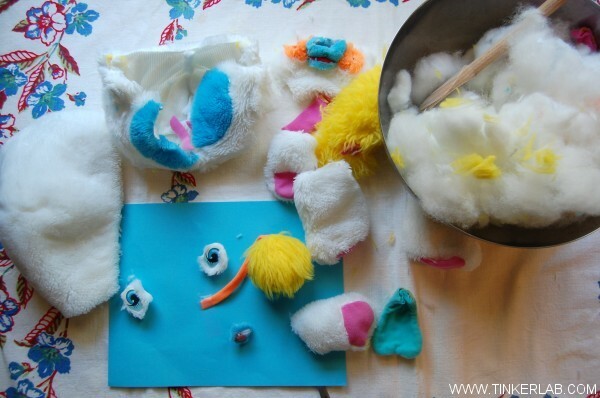 Once the toy was disassembled, she came up with a plan to glue some of the pieces to paper, and this was followed by cooking with the stuffing. 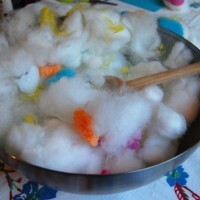 She also asked to save the stuffing in order to make our own stuffed toys. 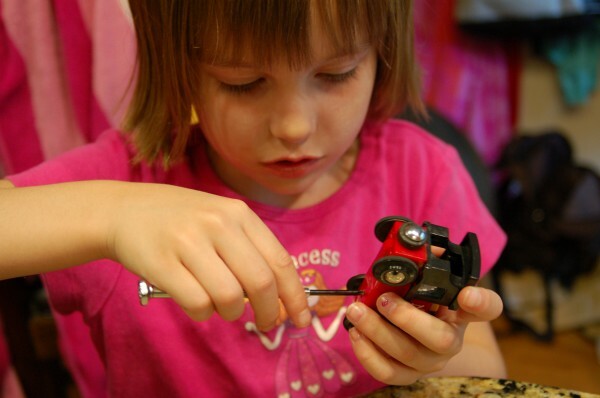 Tinkering is about hands-on experiences, learning from failures, and unstructured time to explore and invent. And through the processes of exploration and invention lies the potential for innovation. Do you think we were successful? 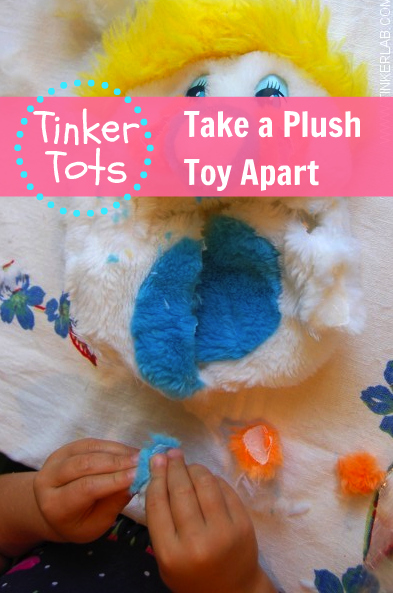 We took a stuffed animal apart — can you think of other toys that could be easily and safely disassembled? 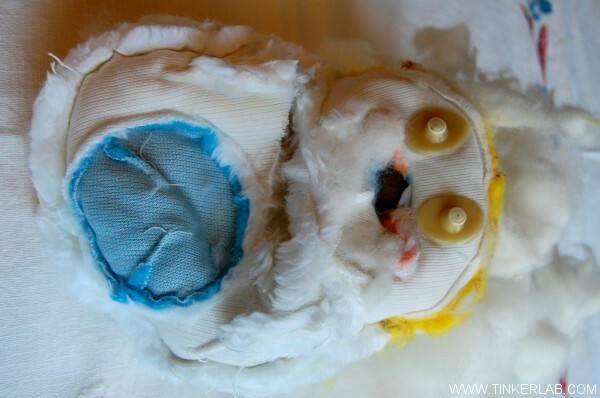 This project is inspired by the Exploratorium’s project: Taking Toys Apart. They have a wealth of tinkering activities on their site and it’s worth pouring over if you like this sort of thing. 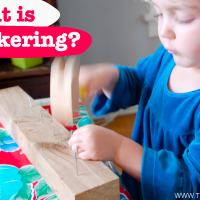 True to the name of this blog, Tinkerlab, I’m excited to start a new series called “Tinker With…” where I’ll introduce new tinker with materials, categories of materials, or tools that can be introduced as open invitations for children to explore. The first Tinker With… will be tomorrow, so read on about why tinkering is important and then be sure to check back tomorrow for more. Last week I wrote an article called What is Tinkering?, and you may enjoy taking a peek back to read it. 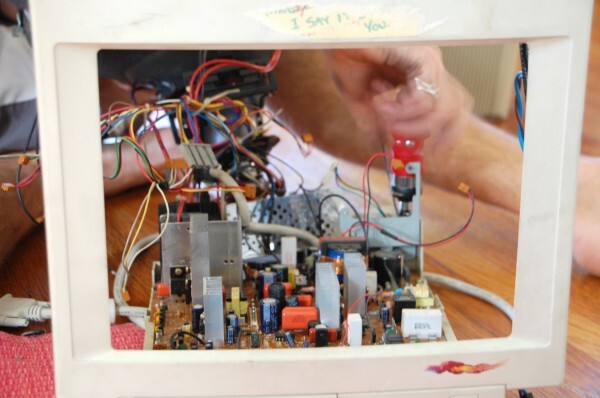 In its classic sense, tinkering is about puttering around with electronics or machines, but in this more up-to-date definition, tinkering is about playing with materials and figuring out how just about anything can be assembled. Why is tinkering so important and why should we care? 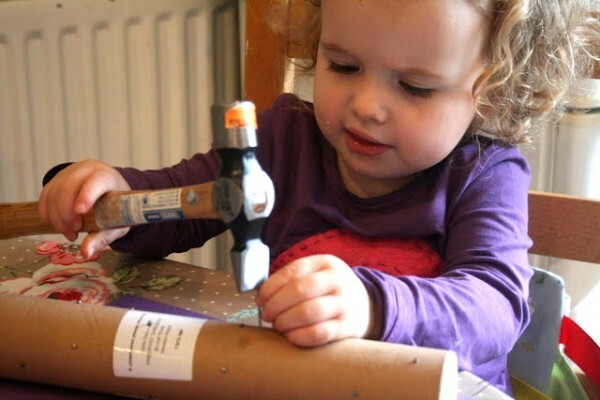 Tinkering is important because it can help children understand how things are made, enables children to have focussed and unstructured time to explore and test ideas, and it’s at the heart of invention. Think of Thomas Edison as a classic example. Edison may be best known as one of the most prolific inventors in history. He’s responsible for the first light bulb, stock ticker, electrical power, and motion pictures. And do you know how it all began? Edison had a rough childhood. Due to illness, he started school late at the age of eight and was deemed unfit for education by the schoolmaster. Hard to believe, right? His mother chose to homeschool her son, where he learned at a much higher level than he would have been at in school. At age ten, Edison built a chemical lab in his cellar. Soon thereafter, he was obliged to take a job selling sweets and newspapers on a train. He found an opportunity in what could have been drudgery, and built another laboratory for himself in the back of the train (very industrious and tenacious of this young boy!). In this train job, he further learned morse code and became a proficient telegraph operator. Overall, he learned how things work together, he was a resourceful self-starter, and he created opportunities to test his ideas from a very young age. What can we do to give our children opportunities to think like Edison? 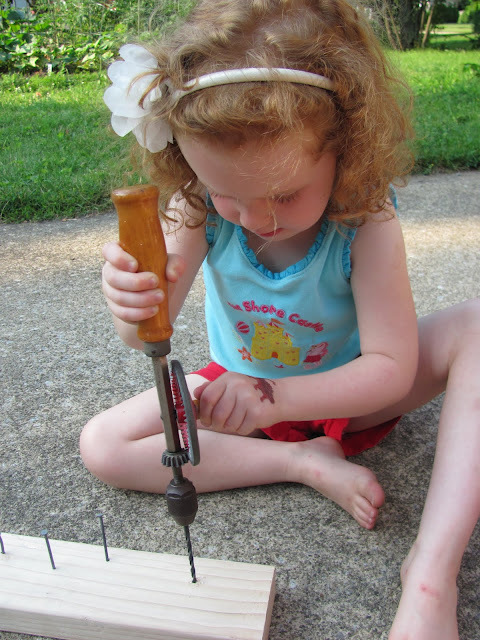 Raising a maker-kid doesn’t mean we have to outfit our homes or classrooms with high tech equipment or tools that our outside of our budget or comfort zone. Think back to Edison who was motivated to build a lab in his basement. What we CAN do is provide our children with opportunities to explore materials, take things apart, and imagine new possibilities through the process of invention. 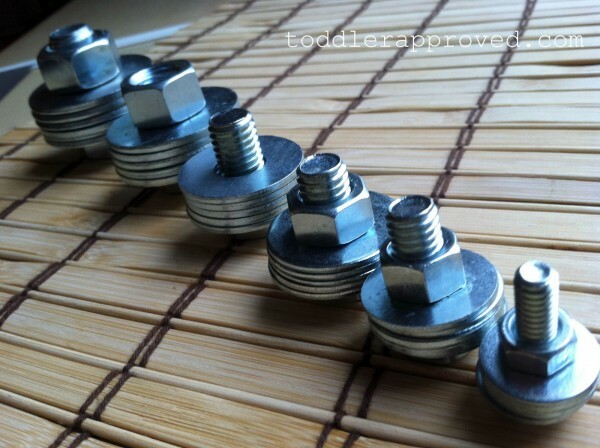 And this can be done simply by providing them with low-cost materials and time to tinker. We’re entering a new era of invention and innovation, and if we want our kids to be prepared for this DIY movement, now is the time to provide them with cardboard boxes, rolls of tape, tools, and a lot of free time to explore and experiment. In addition, we’re fortunate to live in a time where hacking and a DIY spirit are in full swing. Open-hardware invention kits like MaKey MaKey (above), magazines like MAKE and its related hacker-art festival, Maker Faire, open-source software, maker camps such Camp 510, and websites like Instructables make this an exciting time to be a tinkering maker-kid. 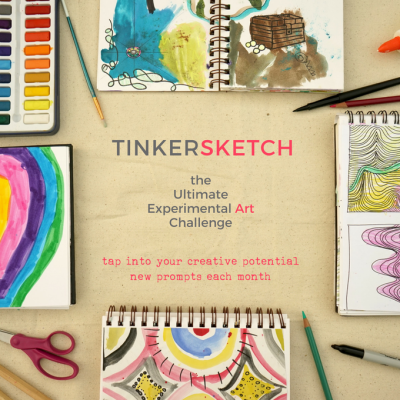 I hope you’ll join me tomorrow for the unveiling of our first “Tinker With” challenge. Special thanks to The Chocolate Muffin Tree, The Imagination Tree, and for sharing their tinkering images with me. You may have noticed this quaint little word that’s at the heart of my blog title, and today I’d like to talk a bit about tinkering. 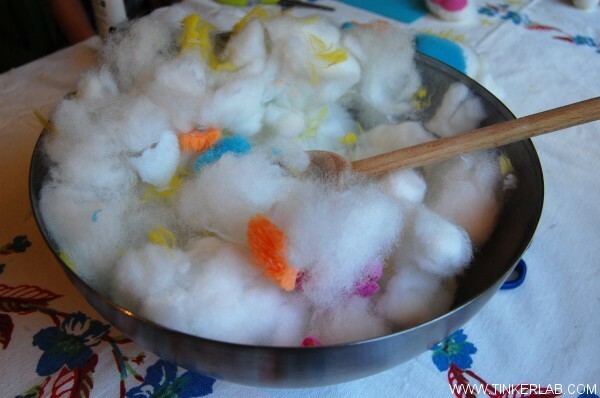 I have a fun tinkering challenge up my sleeve (come back for that next week! ), so consider this my introduction! Taking toys apart. From Melissa at Imagination Soup. The definition above suggests that it’s about improving something by making changes to it. These are all helpful starting points, but hardly conclusive. The kind of tinkering that I’m advocating for is not the kind that’s unfocussed or lacking in purpose, although I can see how tinkering can appear unfocussed to someone who observes it in action. And it doesn’t have to be limited to machine parts and hammers, although it certainly finds a good home amongst these tools. Nope, the tinkering I have in mind is full of focus and purpose, and succeeds at generating new ideas. While we can easily imagine someone tinkering with a screw driver and an old toaster, let’s also consider how we could tinker with paint and brushes, paper cups and glue, an irrigation system, a 3-D printer, photo editing software (who’s spent hours editing a photo book or playing with Photoshop? ), and ideas. This last one, ideas, is an extra fun one. Imagine a room full of creative thinkers with some sticky pads and Sharpies, and you get a clear picture of people tinkering with ways to make the world a better place. To be continued next time…why tinkering is important. And next week you’ll want to stop back for DPS prompts, the Flower Creative Challenge (info on participating can be found here), and the new Tinkering Challenge. Woo-hoo! 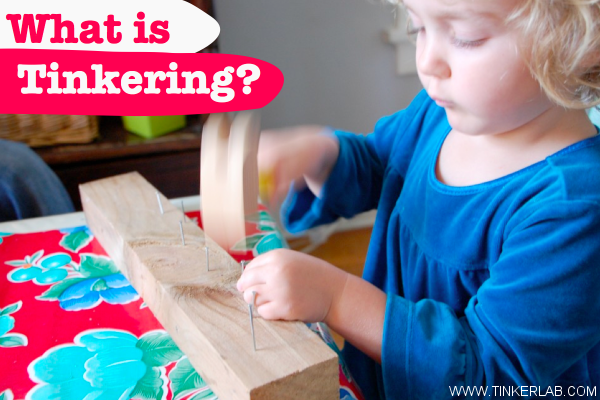 What does “tinkering” mean to you? 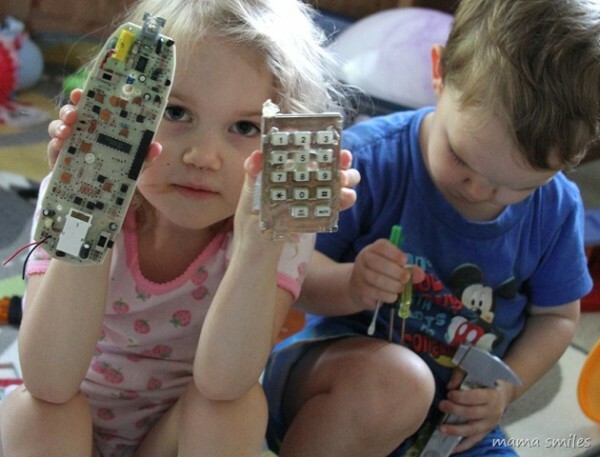 Do you make time for tinkering? 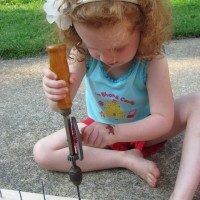 Special thanks to Imagination Soup, Mama Smiles Blog, and Toddler Approved for sharing their tinkering images. My husband works at a university and the collector in me was overjoyed to discover that there’s a little-known department on campus that sells surplus property from departments that no longer need old projectors, desks, and reams of paper. 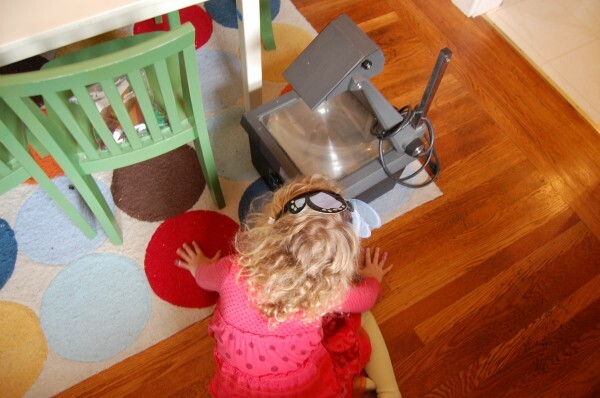 I wandered into the dusty space about a year ago and walked out with something everyone needs: an overhead projector for just $5. Right, you have one, don’t you? And then it moved to my garage where it continued to collect dust for another year. Well, I finally pulled it out and it turned out to be a perfect rainy day art project. My daughter had never seen one of these before, so we started off with an open-ended game in object-based looking that I learned in graduate school. The idea behind the game is to unpack the qualities of a mysterious object based solely on what you can see. No other information is shared, and the process of discovery can build a great deal of enthusiasm around an experience. A box with a long, tall pole and a plug. It’s dusty. You missed a spot. I don’t know. Maybe you plug it in. And I see these knobs, so they probably turn. If I turn this one, this piece moves up the pole. There are some buttons, so you can turn it on and off. I think it makes noise. A loud noise, like a blender. Brrrrrrrrr. A light. Let’s plug it in! I plugged it in, flipped open the light, and spread out a collection of tangram pieces to play with. N had fun adjusting the height of the light and then made various arrangements of shapes, both abstract and realistic. I have a huge collection of transparent tangram tiles that I picked up at Resource Area for Teaching (RAFT), but if you click on this link it’ll take you to Amazon where you can order these shipped straight to your home. I pulled the curtains in the room shut, and the overhead projector’s bulb did a great job illuminating the wall. The walls in this room are painted dark grey, so I taped two sheets of 18″ x 24″ paper from Discount School Supply to the wall, and it made for a perfect screen. We talked about how the projector reverses images, so you won’t see a mirror image of what exists on the glass plate. This art project was wonderful in so many ways. The dim lights in the room were calming and helped focus my child’s big afternoon energy like a cup of tea can focus mine. It was fun to play with something new, and we both enjoyed exploring the mechanics of this archaic tool from Stanford’s past. 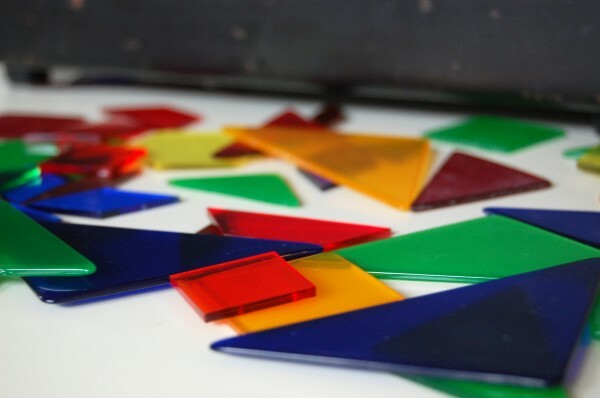 As an artform, working with the tangram shapes was like painting with light and color, while making compositional choices. 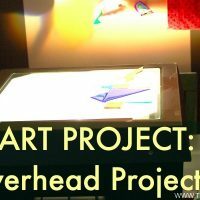 In case you’re interested in finding your own overhead projector, I did a quick Craigslist search and see them posted in the $25-$80 price range, but I bet a little searching could find you something for less money. And if you happen to be in my real-life friend circle, you’re more than welcome to borrow mine for a while, which is better than having it collect dust in my garage. 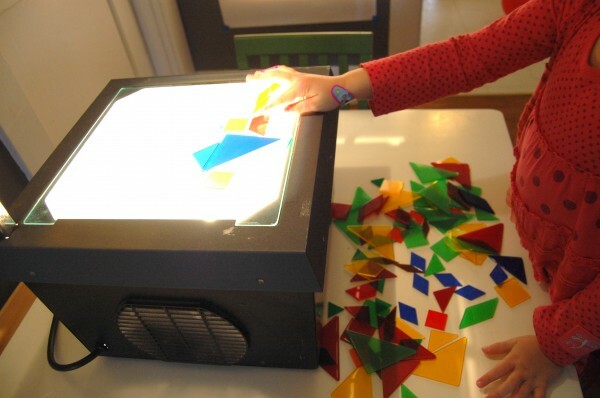 I’m thinking our next overhead projector project might be making our own transparencies. Any other ideas? 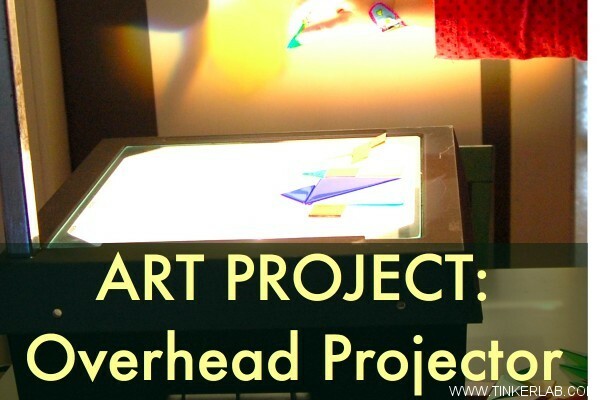 Do you have an overhead projector, light table, or some other type of projector (either of your own or at your disposal)? What could you try this with?